Just recently a client asked us about growth in relation to her follower number. Her follower numbers were growing but it didn’t seem to match the growth of her page views. So we asked the question, does follower growth have an affect on Pinterest traffic? And do more followers equal more page views? Do you need to pay attention to follower numbers as a Pinterest metric? Spotting trends in traffic throughout the year. Helping our clients maximize page view growth. Diagnosing any abnormalities such as accounts being marked as spam or Pinterest conducting updates. Before we dive in, let me remind you that Pinterest traffic is based on a wide variety of factors — images, how often content is created on the site/blog, how engaged an audience is and how often someone is pinning. It’s not a guarantee that with x number of followers you will get x traffic. Each account is unique and brings a variety of factors to the Pinterest table. Keep that in mind just in case you find yourself diving into the comparison trap. Why did we choose these numbers? It will become more obvious as you read through the post. Let’s dive into how follower numbers had an effect on page views within these segments. Under 100K has a lot more variance. We have more data points for under 100K. Even though there is a lot of variance, there is still an overall increase in page views as the follower numbers increase. This led us to take a closer look at smaller to medium sized accounts. And here’s what we found. This segment was interesting. We didn’t see a relationship between page views and followers for accounts under 10K. If you look at the trend line you will see that it’s going down. However, there are other factors that come into play. The accounts that had great success were relatively new to Pinterest. They had been hustling on creating content and engaging their audiences. Some of the others had been on Pinterest for a while but not actively cultivating an audience outside of Pinterest nor were they creating content on the blog side. To get a better picture, we decided to look at 10K-50K followers. As you can see by the peaks and valleys, two clients with almost identical follower numbers had a wide spread in page views. There is still a significant amount of variance in accounts, however, we are starting to see a trend upwards as followers increase. When this happens we move back the curtain to look deeper. One client hadn’t posted new content on their blog for several months while the other content creators were updating old images and keywords to push out ‘new’ looking content which was helping their reach. How active you are on both Pinterest and your blog makes a difference. Head over to this post for tips on keywording and a free pdf checklist. After this, we decided to look at 50-100K followers. Once again, variation. There is no overall trend line; it stays straight and relatively flat. While there doesn’t seem to be a strong relationship between follower numbers and page views in this range, it’s important to note we’re still dealing with page views of 75K to 225K. At this level, clients are still seeing a significant number of page views. Now let’s look at the big peeps! Over 100K. With this group, there is an increase as you go from lower to higher follower numbers. The trend line is obviously up. Quite frankly, we’re dealing with a huge number of page views! Over a million in some cases. Man, wouldn’t we all like this many page views? So what do we get from this information? When you take all of these clients into consideration, there does appear to be a relationship between follower numbers and page views. Lower follower numbers, lower page views, higher followers, higher page views. Yes, there is variation and that variation seems to be due to account culture. This is a term we use here at Simple Pin when referring to the variety of factors that go into the success of a Pinterest account. Account culture is why the account is active and growing or stagnant. It’s based on your readership on your blog, how broad or niche you are with your pins, how many boards you have on your profile, how often you pin content, etc. It’s not just one factor like follower numbers that makes an account grow. It’s optimizing all relevant factors to create a consistent growth pattern for traffic. Use the MiloTree pop-up set to Pinterest. I had it set to just Pinterest for over 8 months and then switched to having both my email opt-in and Pinterest. In that time, my followers have grown by 3000. My page views have also increased too. Listen to episode 13 for more info on how to get more followers on Pinterest. Post on other social media accounts about specific boards having to do with relevant topics your audience is looking for. For example, if you have a game day board with recipes for Super Bowl, you should let your twitter, Instagram or Facebook followers know you’ve curated some of the best recipes and head over to pin their favorites. Maybe you can ask them to comment on ones they have already tried and know are good. Think outside the box. Post a link in your email with your Pinterest page link and what your plans are with it. Pinterest users like to curate ideas. How are you helping your niche easily find those ideas? Be consistent with your pinning, at least 10 pins per day. This shows you to be an active participant on the platform. The Smart Feed likes this. Try creating a blog post about the top 10 boards in your niche. List a few of your own and a few of your colleagues. Then add a pinnable image so this post can live on as good evergreen content. Last, try to post often on your blog. At least 1x per week. For some reason, the clients we have worked with who do not post consistently tend to see a decrease in their page views. It could be due to their audience because their audience becomes less engaged and therefore doesn’t share content. Not sure, but I want to pass on that we see the importance of consistent content creation, even if it’s just 1x per week. Tell us about your experience with follower numbers and page views. Have you seen your page views increase as your follower numbers have increased? Want to learn more Pinterest marketing tips? 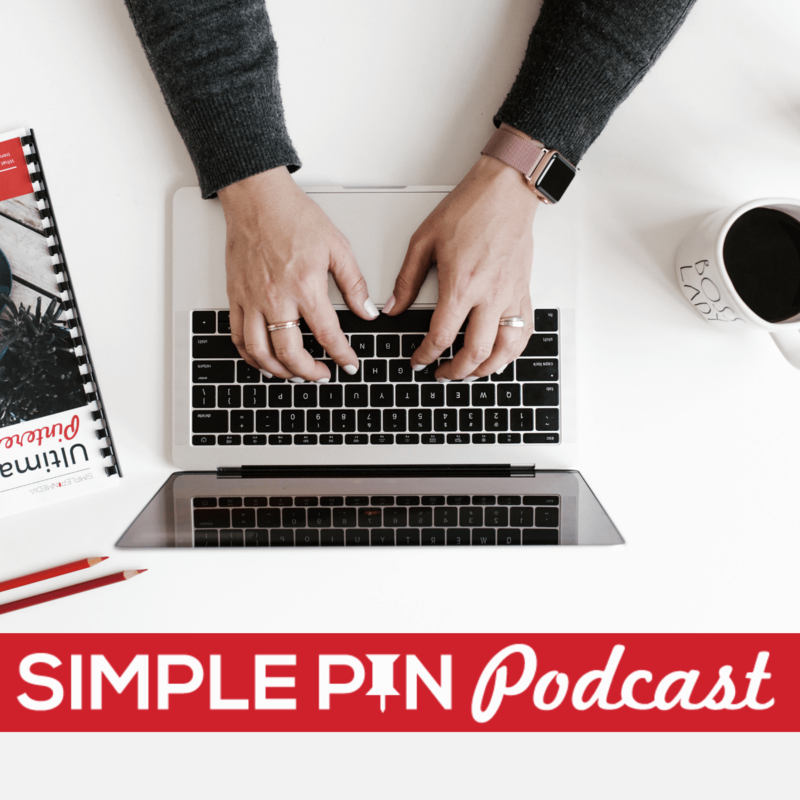 Listen to more episodes on the Simple Pin Podcast. Once again I’ve found very useful post for me to learn some extra regading this social platform. Pinterest boards attract followers on autopilot and send traffic to my site from Pinterest slowly increases each month. It’s a long term investment. You have shown very significant stats which are very helpful to understand this topic in simple manner. Eventually, thanks for sharing your worthy thought with us. Thank you for the information! While I love a great DIY, I’m an enginerd at heart. So statistics and graphs are my thing! 🙂 I’ll keep on pinning strategically and work on that follower growth. When you say “page views,” do you mean traffic sent to the site via Pinterest or are you talking about traffic in general? When I look at Pinterest accounts, the main thing I care about is pins that link to the client’s domain — how many impressions and CLICKS those pins are getting. The other stats are merely steps to get me to those ultimate metrics. My question is also about calculating page views. Where do you find this statistic? In Google Analytics? There, I can see page views overall and I can see percentage of traffic from pinterest. To get the page views in the graphs, did you take the pinterest traffic percentage of the overall page views in GA? Or is there some other place to find Pinterest page views that I’m missing? Thanks so much. Love your podcast, Kate! The chart says “Pinterest Page Views” not Website Page Views from Pinterest. Because there is so little data from the biggest accounts it leaves the question open as to whether there is any correlation at all between followers and website traffic. Thanks for the information. I have been using Pinterest to drive traffic and it has worked wonders for me. I need to look at other ways to get traffic on my site. thank you for sharing this useful informations!